It’s been a long winter of waiting for Cottage Blogger’s own Mike Bayer, and his wife Andrea. It was back in the fall of 2014 that the popular home renovation show, Income Property, and its dynamic presenter Scott McGillivray worked their magic on their Lake Ontario property, Sea Breeze. The wait is over and the show featuring Mike, Andrea and their idyllic lakefront cottage will finally be revealed on Thursday April 16th at 9pm on HGTV Canada. Unfortunately, for those of you in the US will have to wait a few more weeks to see the episode on HGTV, but I am sure that as soon as the air date is scheduled Mike will let you know. Just look out for Season 10 Episode 13. But in the mean time I managed to get a few minutes to talk with Scott McGillivray himself. 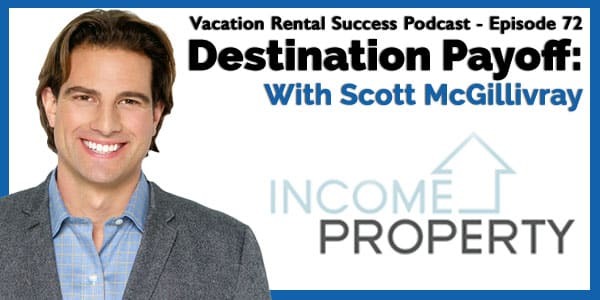 On this episode I get to talk to Scott and learn more about the vacation rental spinoff Destination Payoff, where he and his team renovated four south Ontario cottages with vacation rental in mind. How Scott manages his own vacation properties and why medium-term rentals are sometimes more effective from a management perspective. Why owners should not wait before listing their property for rent. We can’t show Mike’s listing until after the programme has aired so check back on Friday to see the before and after pics. In the mean time you can visit the Sea Breeze Cottage Facebook Page to keep updated on the events surrounding the reveal.